My assignment this month, for this feature article, was Earth Day, and the first feeling I had was sadness. I wasn’t happy, I didn´t feel excited… actually a wave of deep concern rolled through me, so I pushed it away. I closed my heart and my mind until the deadline for submission was looming. Only this morning did I have the guts to face the facts. It feels like we’re in trouble; the Earth is being pushed aside and issues that are real are being neglected. But the Earth cannot be pushed aside. We’re on it, in it and reliant upon it. So I mustered up the courage to explore what’s happening on Earth Day and ask of myself, and of each of you, to consider taking action. The recent Colgate commercial on television, illustrating the waste of letting the water run while brushing our teeth, really got to me. I re-committed on the spot, to ALWAYS turn the water off while brushing. Please do something. Whatever feels right for you. Make it easy, make it happen. It’s our Earth. 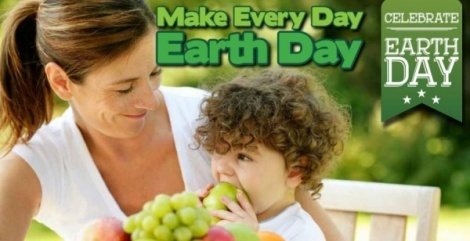 Make every day Earth Day, please. When I was 25 years old, I knew we had to do something to restore our deeply polluted environment. I picked up the phone, wrote letters to anyone who would listen, assembled a crackerjack staff, and before we knew it, we had our country’s attention. The first Earth Day in 1970 mobilized 20 million concerned citizens to demand federal action, spurring the creation of the Environmental Protection Agency and the passage of landmark laws that guide environmental policy to this day. Now, nearly five decades later, the EPA – and science itself – are under assault. That’s why we’re standing up once again. Tens of thousands of supporters like you have already pledged to make your voices heard at the March for Science on April 22nd in Washington D.C. www. marchforscience.com Just like the first Earth Day in 1970, the 2017 March for Science is a transformational moment for our planet. Lab coats in the streets are not a common sight. But right now, climate change deniers and the specter of devastating cuts to basic scientific research, scientists and all those who cherish good science are stepping forward to be heard. We can no longer wait on the sidelines as politicians politicize science and undermine the evidencebased policies that safeguard our planet. Not with climate change accelerating and critical agencies facing massive cuts. Those who treasure sound science will no longer be silent. We are speaking out as one to stand for reason and facts. Join us right now in your city on April 22nd to stand up for science. The March for Science demonstrates our passion for science and sounds a call to support and safeguard the scientific community. Recent policy changes have caused heightened worry among scientists. The incredible and immediate outpouring of support has made it clear that these concerns are also shared by hundreds of thousands of people around the world. ON APRIL 22, 2017, WE WALK OUT OF THE LAB AND INTO THE STREETS. We are people who value science and recognize how science serves. We come from all races, all religions, all gender identities, all sexual orientations, all abilities, all socioeconomic backgrounds, all political perspectives, and all nationalities. Our diversity is our greatest strength: a wealth of opinions, perspectives, and ideas is critical for the scientific process. What unites us is a love of science, and an insatiable curiosity. We all recognize that science is everywhere and affects everyone. 7) Be The Change You Wish To See On and FOR OUR EARTH! The year 2020 marks the 50th anniversary of Earth Day. We must seize this moment to inspire global actions that safeguard the earth against the unprecedented challenges of the 21st century. In the four years leading up to 2020, Earth Day Network will launch a series of bold, thematic initiatives to galvanize unparalleled global collaboration. Earth Day 2016’s theme was Trees for the Earth. That year they set the ambitious goal of planting 7.8 billion trees – one for every person on the planet – by Earth Day 2020. The theme for Earth Day 2017 is Environmental and Climate Literacy. Get Involved. Give to the Cause. Visit https://www.facebook.com/ events/1904314703139244/ for more info on the People’s Climate Marches!